Need to insure a Dump Truck? Give us a call and save ££ today! One Sure Insurance is able to source extremely competitive insurance quotes for Dump Truck Insurance. As part of our Special Types insurance scheme, we are able to place Dump Trucks on tailor made, bespoke policies that cover you on either a Comprehensive or Third Party basis. No matter whether you are using your Dump Truck on private land, or on the public road, we will be able to source an insurance policy that helps to keep your mind at ease - knowing you are protected should anything happen to your Dump Truck assets. Our Comprehensive Dump Truck insurance policies cover you against accidental damage, fire, theft and attempted theft. 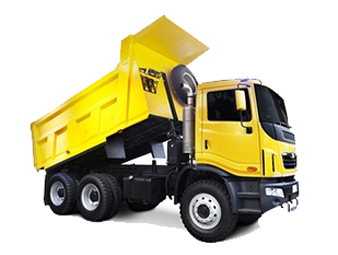 If you are looking for less protection, then we may be able to cover either an individual Dump Truck, or a fleet of Dump Trucks on a third party only basis. We can also package and combine other insurance policies together - such as public liability and employers liability. If you're on the market for Dump Truck insurance, and you want to get the most competitive quote on the market, be sure to give One Sure Insurance a try today!